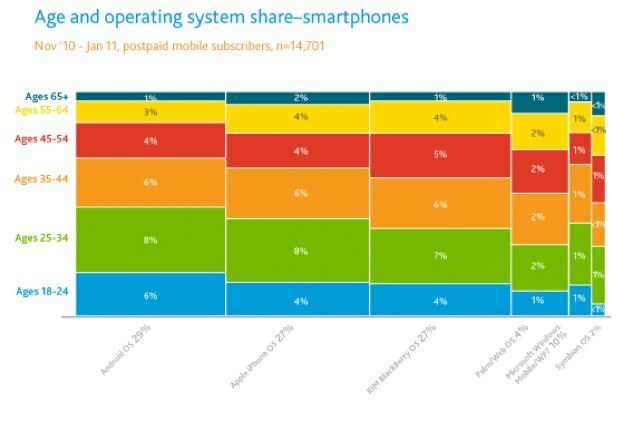 Nielsen has just released new data on U.S. smartphone share. According to the report, smartphone powered by Android operating systems (29 percent) is pulling ahead of RIM’s Blackberry (27 percent) and Apple iOS (27 percent). But Nielsen says that because RIM and Apple create and sell their own smartphones with their operating systems, these companies are actually in a better position in the three-way race (in terms of device manfuacturers). Because Google licenses its OS to device manufacturers, the Android ecosystem is more fragmented. 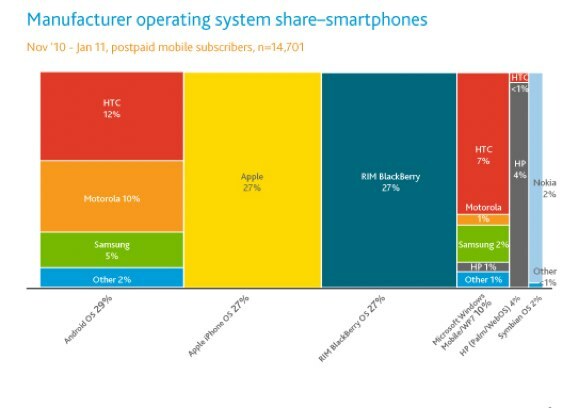 In terms of the break down of Android OS, 12 percent of Android smartphone owners have an HTC device, with Motorola following behind with ten percent share. Samsung comes in third with five percent. Nielsen also says that a higher percentage Android users fall into a younger age group (8 percent) vs RIM (4 percent) and Apple (4 percent). Over the past few months, Nielsen has consistently reported Android’s growth as a smartphone operating system. And other research firms have released similar data as well. But as Nielsen says in this report, RIM, Apple and Android are still neck-in-neck, so it’s a close game where anyone can pull ahead.